I get really frustrated with myself when I notice the negative or put out a dark side of something. It’s not a quality that I want to keep. It’s tempting to try to delve back into the past and figure out where it comes from. I can get all the insight I want, but insight isn’t going to change me or help me improve. It’s more useful to see when it is popping up and try to change. One of the fellowship’s principles is that ingrained traits like this aren’t going to go away on their own. I can be completely ready to do something different, try as best as I can, and still put out the negative words that I’m trying to move away from. I’m trying another way and asking in prayer to act on the opposite principles. Perhaps I need hopefulness and optimism. Since I’m not making progress on my own, this seems like a good idea. An opportunity to avoid putting out negative thoughts is to try to avoid chiming in on the two big U. S. Supreme Court decisions this week. It’s a very divisive subject and I don’t know how to say anything healing or unifying about it. It’s really tempting to point out this idea or reference some explanation that seems logical to me, but I’m still just another wind chime. A few years ago I bought the toy zometool. I bought a lot of different pieces from different collections and now I have more than I’ll ever need. 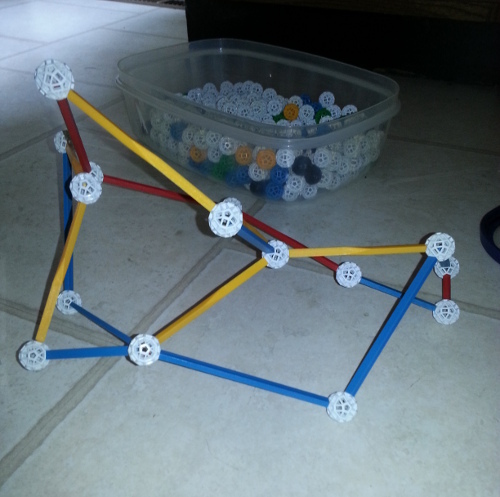 Zometool is really cool because it lets you build things without worrying about “forcing” things to fit. If a piece fits where you want it, then it fits exactly. This construction was just put together by me picking a few struts and then extending them until they could close back on themselves. 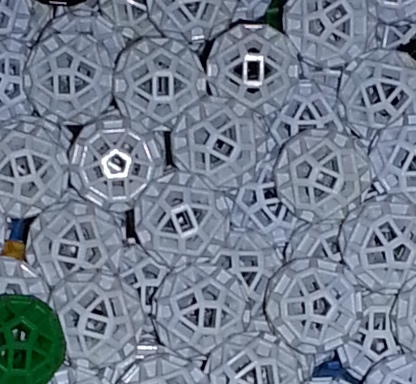 This is a hint at the wide variety of shapes zometool lets you create the opportunity to be creative is endless. The nodes that the struts are attached have 3 shapes of holes. Triangular that take yellow struts, rectangular that take blue struts and pentagonal that take red struts. To me the math behind the design of the nodes and the lengths of the struts is very cool. Each color of strut comes in 3 lengths. The ratio between the lengths is the golden ratio . One of the properties of the golden ratio is that . So, if I have one piece that is the golden ratio longer than the second, I have a strut with length and . The next longer strut would be . That means if I want the equivalent of the next longer strut, I just need to add one of each of the two lower lengths. I cook gluten-free. My sister, some nephews and nieces and I all have negative reactions to gluten. One thing that’s frustrating about gluten free cooking is trying to make dishes that need flour. Gluten glues flour-containing products together so that they have body and don’t collapse and are fluffy. A gluten-free recipe doesn’t have that available. 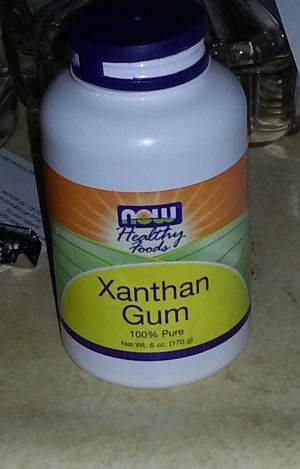 The way I solve that problem is to add either xanthan gum or guar gum. They are sticky and help hold things together. I’m pretty generous with how much I use, so my recipes end up costing more if you’re counting such things. One of the brands of xanthan gum available. Yesterday and today I had been making cupcakes with my Great Grandma Lake’s recipe. It is a very fragile recipe. It is not very forgiving of mistakes. Although it is totally not PC, when my grandma would make cakes with the recipe that failed in some way or another, we would call them cripples. A sign that it is a hard recipe is that even after years of making the recipe for holidays, she still often made cripples. The first time I made cupcakes several years ago, everything was cool. It seemed to work like a regular cupcake recipe. Today and yesterday, not so much. I made a bunch of mistakes. The first batch didn’t have any xanthan gum and the cupcakes collapsed before they were done cooking–it was awful — a few ended up in my stomach but most went in the trash. Today’s batch went better. But here is where I learned something…. The first pan of cupcakes today fell pretty badly. The second pan was a little better and the third was pretty close to normal. As the batter aged and I waited for the first pans to cook, the batter got thicker and thicker which correlated with the cupcake’s falling less and less. I have noticed the batter getting thicker when I used xanthan gum to make waffles, but I thought that was just what pancake batter does. Now, I believe that if I let a dish rest before cooking it, I might need less xanthan gum and also the recipe will act more like it was made with whole-wheat flour from the start. So, in summary, my conclusion is that when I make a dish with xanthan gum, I should let the dish age for 20-30 minutes for the xanthan/guar gum to begin to be sticky and then start cooking. Here’s the recipe for the brave and curious Grandma’s Cake. The recipe gets really dry if you overcook it at all. I use a lot toothpicks when I’m cooking this.